Gretna Wedding Cake Shop- Order Online Today. Why choose a Gretna Wedding Cake from Jenny’s Cakes? We provide high quality wedding cakes, baked and decorated by hand and personally delivered to your venue in and around Gretna/Gretna Green. 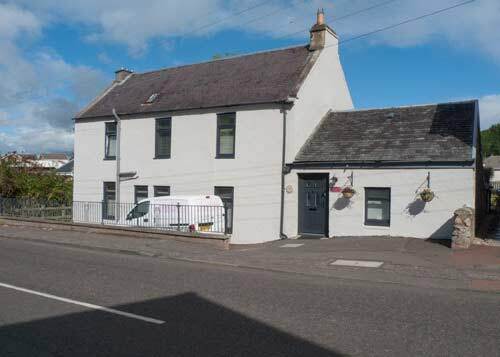 We are recommended suppliers to many of Gretna’s most popular wedding venues, including Smiths Hotel, Greens Hotel, Gretna Hall Hotel, The Gables Hotel and The Mill Forge. You can now personalise and order your Gretna Wedding Cake directly on this website- just click the small photos below for more details, choices, pricing and ordering information. *NEW* Book your Gretna Wedding cake with a Deposit of just £60! Gretna Wedding Cake-One-tier Vintage Wedding Cake with Diamante Heart Brooch. 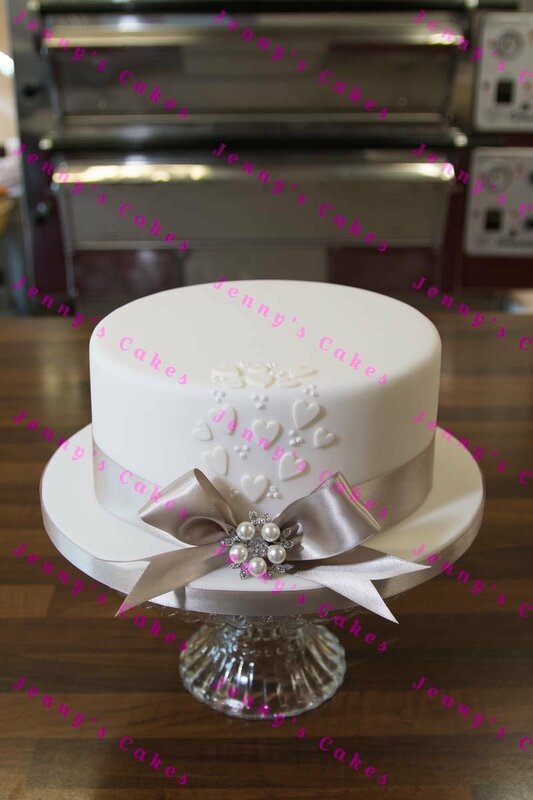 Single Tier round Wedding Cake with diamante heart brooch (design may vary) and sugar hearts. Provides around 25-30 portions. This Gretna Wedding cake has been designed specifically for smaller weddings at Gretna- a small round wedding cake, decorated with a wide satin ribbon tied in a bow. A vintage-style brooch is shown over the bow, and delicate heart-shaped cut-outs cascade down the front of the cake. A narrow satin ribbon finishes the bottom tier. Choose your combination of flavours from Vanilla, Chocolate, Real Lemon, Victoria Sponge, or our new Light Golden Rich Fruit Cake, all made to order by hand in our bakery. No need to worry about couriers,collecting and transporting your cake, or assembling the cake yourself! Just fill in the order form opposite and we will do the rest, including personal delivery to your Gretna venue! We aim to confirm your order within two working days. Jenny and Tom Breen, Directors, for Jenny’s Cakes. Why should you trust Jenny’s Cakes? We have over 32 years experience as a professional family business. 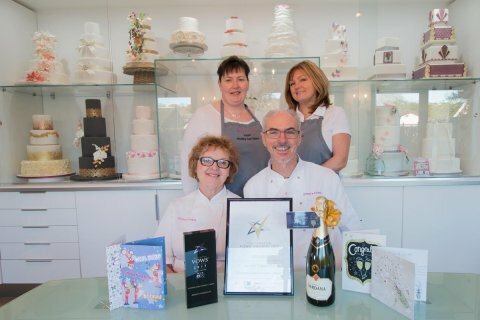 We are proud to have won multiple National Wedding Cake Awards and nominations, based on customer feedback and our drive to provide excellence in customer service. 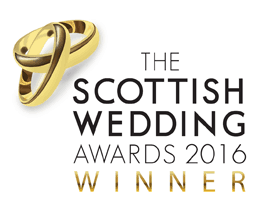 Jenny’s Cakes are winners of the prestigious VOWS AWARDS for 2017 Wedding Cake Designer/Baker of the Year (also known as the Scottish Wedding ‘Oscars’) . 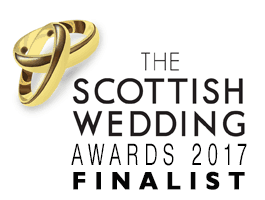 We were National winners of the Scottish Wedding Awards National Wedding Cake Designer of the Year in 2016, and Nominees for the 2017 Confetti Awards. We have selected a number of smaller wedding cakes suited to weddings at Gretna Green. Our range of ‘Gretna Wedding Cakes’ represents Exceptional Value for money, but still maintaining our famously high quality taste and finish. You can choose from a range of flavours including vanilla, chocolate, lemon, victoria sponge and light golden rich fruit. You can also choose cake colours, different ribbons and even different sizes too! Our shopping cart allows you to try different colours, flavours etc. and will calculate total pricing for your wedding cake, including delivery to your venue in and around Gretna. You can then Book your Wedding cake with a Deposit of just £60! We have achieved these low prices by simplifying and standardising sizes and decoration, and saving design time and ‘Tea and Tasters’ sessions and design consultations. Importantly, the quality of the cake itself is of the same high standard as all our more expensive and complex cakes. If you would like to spend time with us in extensive customising or personalising your design, we would respectfully suggest arranging a FREE Tea and Tasters and design consultation at our bakery. We can then design and price a wedding cake specially for you! If you have specific ideas about your how you would like your wedding cake to look, please get in touch- we would be happy to discuss your ideas in more detail. We hope you like our range of Gretna Wedding Cakes, and we hope to hear from you soon! With kindest regards, Jenny and Tom Breen (Directors of Jenny’s Cakes), Christine and Audrey! Multi Award-Winning Wedding Cake Bakers! Jenny’s Cakes Ltd is an Artisan Wedding Cake Bakery with Over 30 Years in business- we create award-winning wedding cakes and deliver each cake personally to wedding venues all across Scotland. We make a limited number of wedding cakes (typically just FOUR-FIVE cakes) each week. Enquire below to check our availability for Your Wedding Date! Jenny's Cakes Ltd.2018 © All Rights Reserved. Jenny's Cakes - Wedding cake Availability Check. Would you like a Free Wedding Cake Consultation?